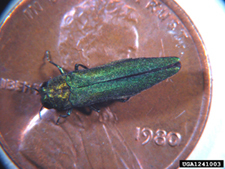 The Emerald Ash Borer is a non-native invasive insect that threatens all ash trees, and has already reeked havoc on millions of acres of forests in the Mid-West. Learn more about the insect and its potential impacts in Western New York. A multidisciplinary task force will be created to address this growing problem in our region. This entry was posted in Uncategorized and tagged emerald ash borer, forests, invasive species. Bookmark the permalink.